Japanese games don't get released very often on PC, and when they do the ports are all too often clumsy, rudimentary things. It's a sad state of affairs, as it means PC gamers are missing an entire culture of gaming from their history, and their experiences of bona-fide classics like Dark Souls or Resident Evil 4 may have been tarnished by a half-hearted transition. After being released on console last year, Konami and co-developers Platinum Games recently unleashed the bizarrely titled Metal Gear Rising: Revengeance on the most enduring of platforms. And thank goodness they have. Not only is it a good port, it's a good port of one of the most refreshingly unrestrained, unhinged and uncompromising action games we've played in years. It could be better still, as that uncompromising nature sometimes works against its expertly engineered combat system and brilliantly conceived action sequences. But in terms of sheer spectacle and satisfaction of play, it makes your Call of Dutys and your Battlefields look as dull as Ed Miliband's socks by comparison. Revengeance is a continuation of the Metal Gear story, chronologically the latest entry into the canon. For the most part though, Revengeance tells its own tale, so the series' on/off relationship with the PC won't impact on your understanding of the plot too much. Speaking of which, Revengeance's telling of its story is long and detailed, a point which we'll get onto later, but for now all you need to know is you play a cyborg ninja trying to unravel a conspiracy in a world dominated by private military companies and arms manufacturers, who are quite happy to sacrifice the human soul in their ongoing attempts to weaponise the human body. 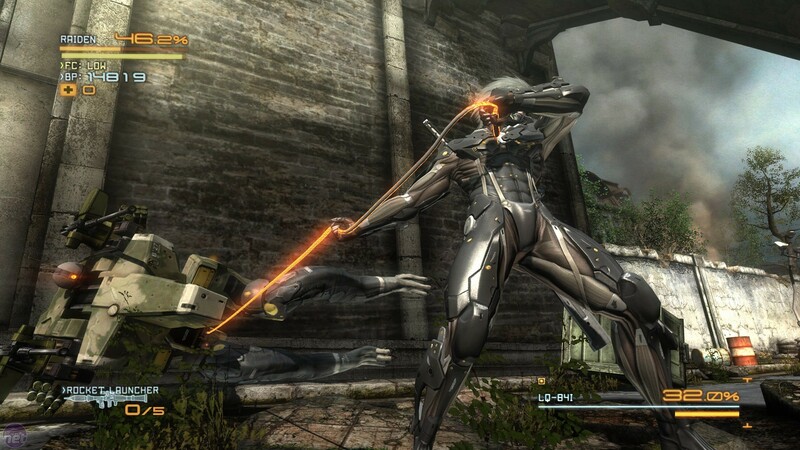 Almost every character you encounter, including the lowest level grunts, are cybernetically enhanced in some fashion, and the playable character, Raiden, is a prime specimen of these technological advancements, able to run at the speed of a motorcycle, deflect bullets with his sword like a human windscreen wiper, and carve up opponents ten or twenty times his size without breaking a sweat, although that could be because his sweat glands have been engineered to secrete liquid awesome. You, on the other hand, will be perspiring plenty, because Revengeance isn't the sort of game that forces you to take a back seat. 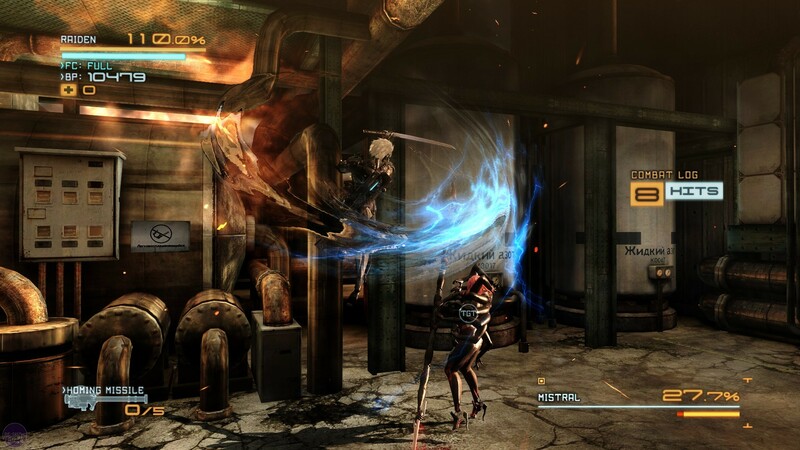 Central to the game's combat system is a directional blocking technique which involves pressing the "light-attack" button while simultaneously pushing the analogue stick in the direction which the attack is coming from. No doubt by the use of the words "analogue stick" you've surmised the game is ideally played using a joypad. It can be played using the keyboard and mouse in the same way that you can steer a car with your feet; it works, but that's simply not the way either the car or your feet were designed. Hence there's a certain amount of skill and learning involved in fighting, so it does take a while for this unique system to click. But when it does, it feels fantastic. In my case it clicked when Raiden stopped a charging, twenty-foot mech in its tracks with his outstretched hand, an attack I'd previously assumed to be unblockable. Realising that you can stop almost anything provided you learn how to counter correctly is immensely gratifying. Alongside direction, timing your blocks is equally crucial, as a perfectly-timed parry will leave your opponents open to a counterattack. This allows Raiden to bash them around a bit in impressively acrobatic style, but this also fills up his energy meter, which ultimately enables him to perform "Zandatsu". This is the other key system of Revengeance, through which cyborgs and other opponents can be chopped to ribbons using Raiden's "Blade Mode". Pressing the blade mode button slows down time and offers more precise control of Raiden's swings. 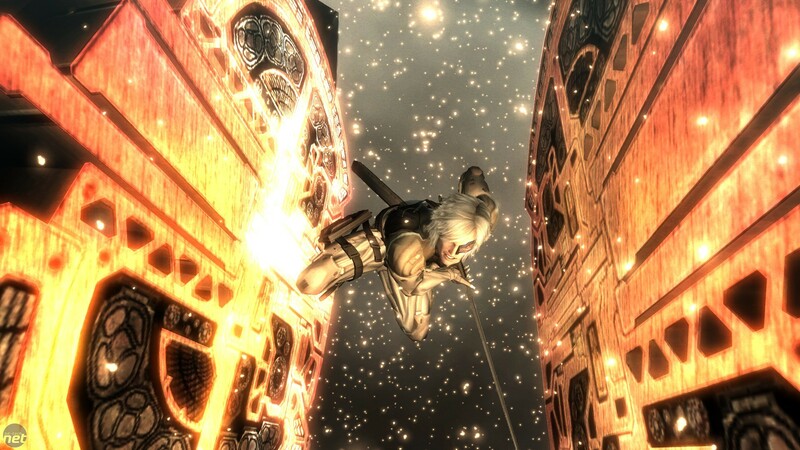 Any part of an opponent's body can be sliced into sushi, but targeting their core gives Raiden access to their central energy supply, which he can absorb to automatically fill his health and energy again. The result of this is, when performed correctly, combat becomes a ferociously fluid dance, and one that, unlike so many games these days, you are completely in control of. It is also, of course astonishingly violent, although the game is surprisingly self-aware of this, and addresses the subject at length. It's refreshing to see a game actively question and debate its own violent nature, rather than glossing over the fact or attempting to justify it through jingoistic patriotism. Especially interesting is the fact that Revengeance's solution to this problem is not at all an ideal one, again something it is fully understanding of. It may be seven years late, but Vanquish is still a thrilling and subversive cover-shooter.